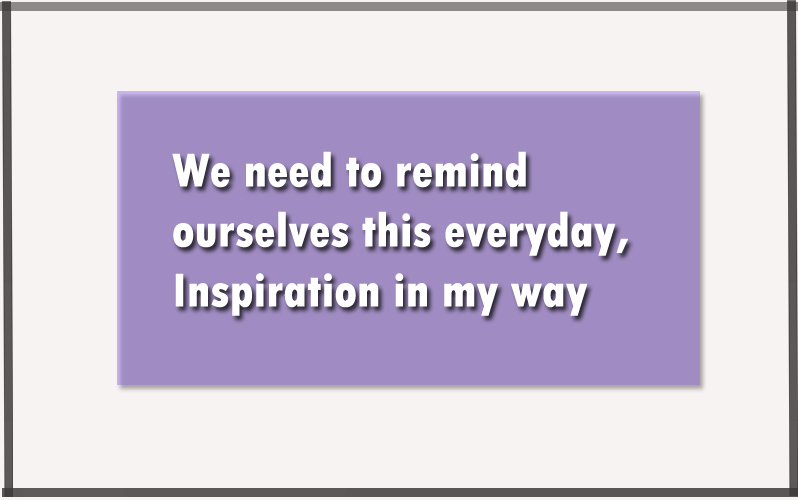 Home / Inspiration / We need to remind ourselves this everyday, Inspiration in my way. 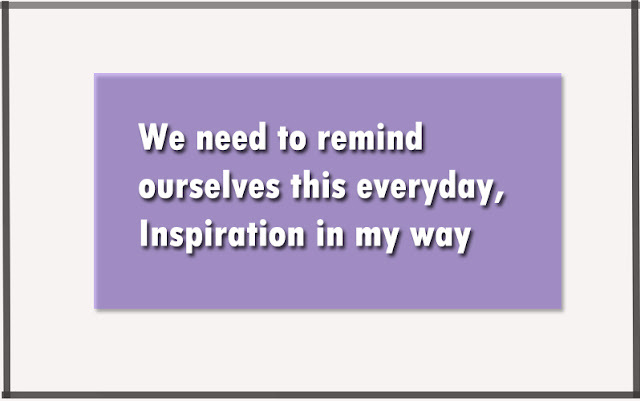 We need to remind ourselves this everyday, Inspiration in my way. This is the third day of my posting schedule which technically, counts as a week, and I'm glad that I'm doing very well and as planned. Also, I thought what if I want to post an extra one that is not scheduled? it won't be in a single day, but rather it will be as a bounce share in one of the three days. This idea will be useful later when we have more content and still there is more to share, but as for now, I'm sticking with no extra. Working with a schedule helps to get rid of the excuses we intend to say every time we should get something done. Being overwhelmed by so many things to do would be one of the excuses that may get in your mind and stop you from doing everything. Like imagine, you trying to organize the room after the kids finished playing with the legos, but there is still a bunch of legos that your both hands can't pick and yet, you keep trying and it slips off. If we stupid enough we will keep trying thinking that it's the only way till we give up(haha actually, that would be interesting to see this happen in real life), but rather we decided to pick few each time until we get all of it on the bucket or wherever you put them, and this how scheduling helps to finish everything and still have time. Is anyone excited for Christmas or is just me? I've been listening to music and watched a movie like it's already the actual day haha. It's true once the day comes, you start to feel like it's not Christmas anymore. Hope you all enjoying every single minute left in this year and this month. One way to motivate people is with quotes, but what if there is something else we can add to it that may make it more attractive and fun to read. We are going to find out with my attempt on this post and I'm not going to explain it because I want to make it more interesting to try and figure it while reading it through. Imagine running around in the football stadium just kicking the ball with no intention to score. That wouldn't be good for you wasting your time and not finishing anything from the list which you should get done or finish. Also, for other people to keep following you, I mean, I don't know why they would follow you, but I guess their goal is getting the ball haha because you are playing. However, if you aim to score, you may get it done or life would tell you to give it another shot and that's when the goalkeeper catch or block the ball from getting into the goal, but you still got something done and learned from it. Every morning you wake up, make sure to set goals of certain things that you should finish or want to get it done by the end of the day and start working on it. That would save you time and let you enjoy that video game session or watching a movie. Also, it helps you to achieve most of the things we do it daily and help you get ahead of schedule if you add some other stuff that requires more time and effort. Have you ever noticed that when building a house or something with legos, it will be faster if you keep placing them till you finish it? However, when you stop or get distracted by something else, whether you won't get it done in time or it will be destroyed by someone else, your kid or someone walks over it by accident, haha, It's true. I can imagine two brothers play lego and once one finish building and the other brother would run through it and destroy it haha. This is something I personally learned from my experience of blogging. Working consistently is important for achieving any goals you have in your list. If you don't do that way, you will end up being late on everything and may not have the motivation to keep going or get distracted by other things in life that is not necessary to you or your goals. On the other hand, you would start to achieve a lot of stuff as you work slowly and get results. Sometimes we compare results based on what we see ourselves in the future and that is the main reason why disappointment happens to us while chasing our dreams. Always, don't expect any result from what you do or give because why not make it a surprise for yourself as well if you do well, but if you didn't do well you won't feel down either. Another thing I learned from my life experience is that you can't expect anything to happen faster than it should be. Imagine your plan is going to get some grocery and you set a limited time to spend 15 minutes only, after half an hour, still looking at all the products as you drive the shopping cart trying to find what you want haha. This is a true story and it happened to me many times. Don't set a date or a time for you to get results from your work, instead, you need to work on whatever and just enjoy it. Actually, when you enjoy doing it, time won't be a concern at all and it will fly so fast that you will never how many hours were spent on working till you get to where you are. I would say imagine playing video games and keep saying that it will be the last game for hours haha. That is something I also do haha because it's fun and sometimes, you don't want to turn it off feeling loser haha. There is a lot of quotes and stuff to talk about in our life, but I would say it's enough for today's post. I hope you enjoyed reading this and get something out of it. This is not Monday motivation or anything I'm going to write like these randomly and always looking to get better, sharing your opinions on it would help a lot. Thank you for reading and wish you a good evening! Scheduling definitely helps in all aspects of life. I found I can be much more consistent with my blog (and in life) when I have things planned and scheduled. Between my husband and me, our schedule is crazy, so we have a shared calendar to keep it straight. I always find it tricky to stay motivated and on schedule this time of year so thank you for the inspiration! Will try my best to set achievable, realistic goals- hopefully the feeling of accomplishment will keep me going! Planning and goal setting is so important to success. Hard work without a game plan will get you nowhere. Beautifully inspiring post! Thank you for the positive thoughts! I always think I will stick to a schedule but then I can't for one reason or another... I guess life just gets in the way lol! Great articles, will follow to get more ideas in future. Planning can be difficult, but it is such an important step towards meeting your goals! It is really hard to succeed if you do not have some sort of plan. I absolutely agree that organization and consistency are very important. I love making my to-do lists. They keep me motivated and on track. I am personally very excited for snow over Christmas! Sticking to a schedule is so important, it helps me get things done and even when interrupted I am better at staying on task if it's scheduled. I cannot wait for Christmas! For me, looking forward to things such as special occasions with friends and family keeps me motivated. I think I could have written this post myself! haha I'm a natural procrastinator. Yep, I have known it for very long, and I have become an organisation freak to balance things up. It's all about setting goals!! Putting together consistent goals is so important if you want to accomplish anything. You are right that when we get distracted and don't keep doing at least a small bit, we will get side tracked. I have recently learned the benefits of keeping a good schedule and it is paying of with my writing and in my personal life. So inspiring with amazing tips. It has motivated me to set a schedule and adding due date.